I am thinking this is a challenge others in the forums have faced / may currently face. 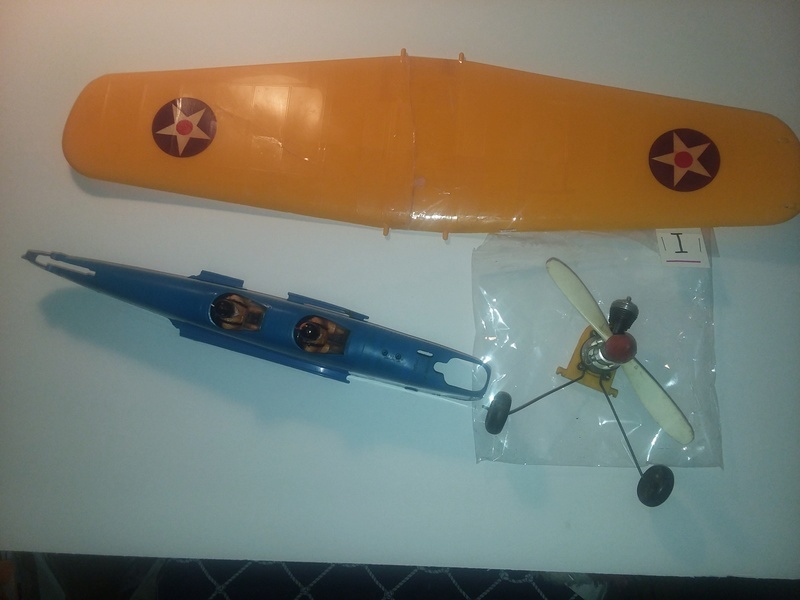 I received one complete PT-19 from eBay with quite a few parts from another damaged one. The wing that came was split in two - see pic. I took the first step and tried to weld the two halves back together with Testors Plastic Cement, which is mostly MEK, I believe. Since that had no positive results, now I am looking for clever ways to join them together before I overdesign a solution. 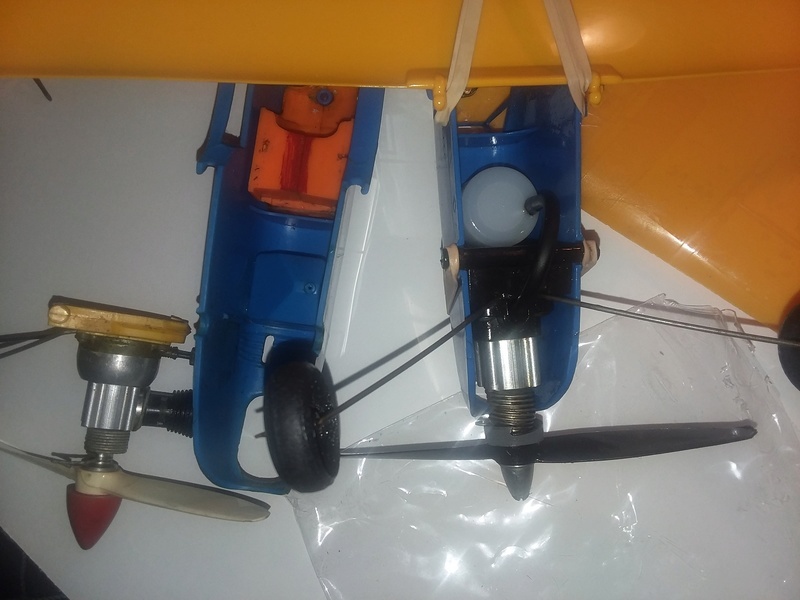 My straw-man fixes at the moment are making a balsa "plug" that resides on the underside of the undercambered wing, about 3-4 inches wide, and screw the wing haves to that form. Or, get a little crazier and do something with 2oz glass cloth. Basically, create a sister to the wing to attach the halves to. I had one just like that..... I took a piece of dryer sheet and saturated it with testors plastic cemet on upper and lowerpart of the wing. let it dry for 24 hrs, You dont see it because the fuse covers it up, I know it sounds crude but it works, Mine is still flying. Peter, I can't speak from experience.. but if there's still a "clean break".. 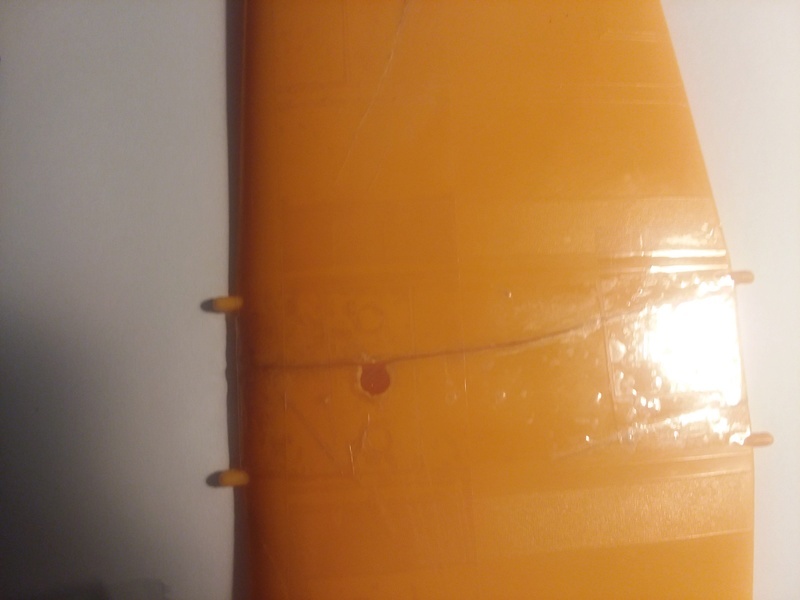 I would try taping the wing with a good-quality clear packing tape such as "Scotch" Moving and Storage tape. Clean the break-area with rubbing alcohol. Fit the joint together as tightly as you can and tack the "bottom" with a 4" strip, leaving a 1" space on each side of the 6" chord. Avoid tape-wrinkling if possible. Invert the wing and place a woodblock under one wingtip, which will help to hold the joint closed.. and establish a slight dihedral-angle. Then apply an 8" strip to yield a 1" over-hang at the L/E and T/E.. then wrap the two over-hanging strips around the L/E and T/E. Tape right over the nubs for the rubber-band mounts. Apply another 8" strip to the bottom-side; as was done with the top-side. Keep everything clean. Don't touch the wing with your fingers after you clean the break-area.. and again; try to smooth the tape "flat" avoiding any wrinkles that could allow oil to creep under and dissolve the adhesive. Two great solutions on the boards. I am inclined to tape first, and see how that lasts with fuel. Should have thought of using hobo-weld/speed-tape, from the first. Then onto a plastic cement bandage/plaster if needed. HA! That cracked wing is nothing that money won't fix! In peticular a plastic credit card. They don't send them in the mail everyday, like they (the banks) but an old expired, or unused one or two will do. I can't locate them right now, but one of our members used a bank card to support a broken wing using epoxy and some clamps. Used just like the dryer sheet to give extra support to the wing, being glued to the underside. I'll see if I can find Bob's posts of his repair. Anybody ever tried one of those 'Lazer Glue Pens' that were constantly on TV ads a while back? I have one of those, worth a try to weld the two halves together before taping them. Add to the strength. Kim wrote: Anybody ever tried one of those 'Lazer Glue Pens' that were constantly on TV ads a while back? Peter's P-19 wing can most definitely be mended.. but "weight" is always a consideration with an airplane. If the wing "had to" break, it could have broken in a worse spot. Breaking near the "root" as it did, will make a repair less visible..
Peter... if the wing needs a more heavy-duty (heavy-weight) repair; there's always the option to counterweight the nose and put a hot-rod engine in it! However you mend it; try to maintain the original dihedral-angle. 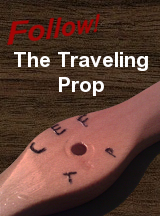 It will likely make a big difference in the way the model fly's. Here you go - tape is the answer. If it only lasts a single outing, that is sufficient. 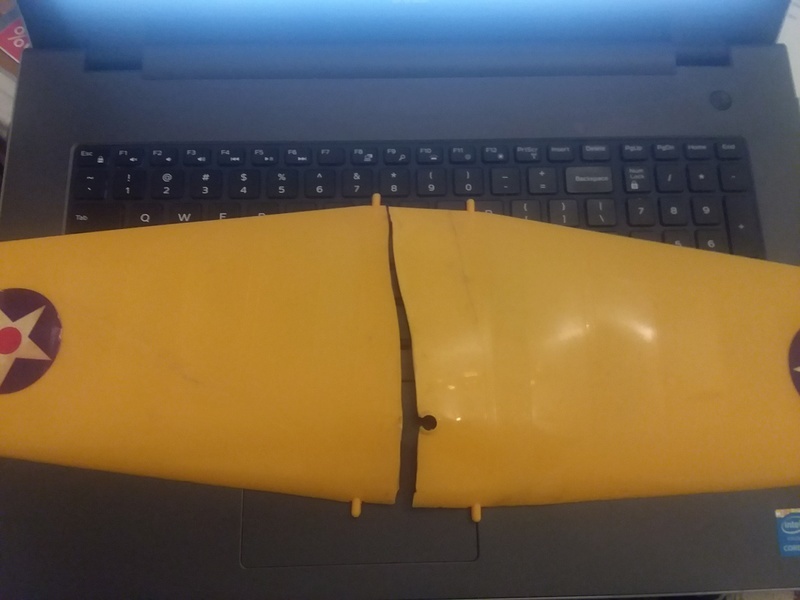 I just picked up a PT-19 compatible engine and motor mount from eBay for an appropriate price. The one in my pic below is a Babe Bee, of course, and just won't fit in the later revision fuse. It would work if you put a spacer between the engine and the mount/firewall. 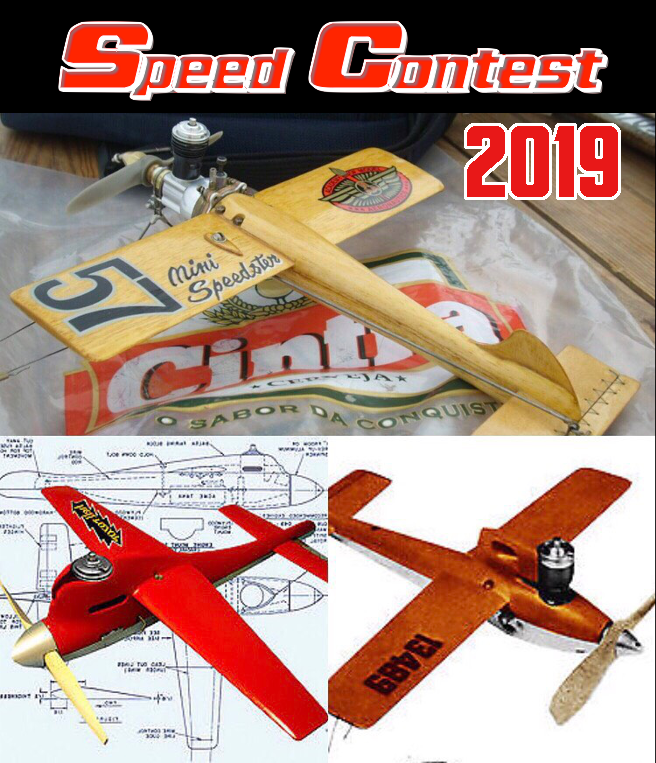 Need a vert fin and stabilator (technically, could fab these without too much pain), and a control horn + push rod and I am in business. I can fab the control horn, of course. 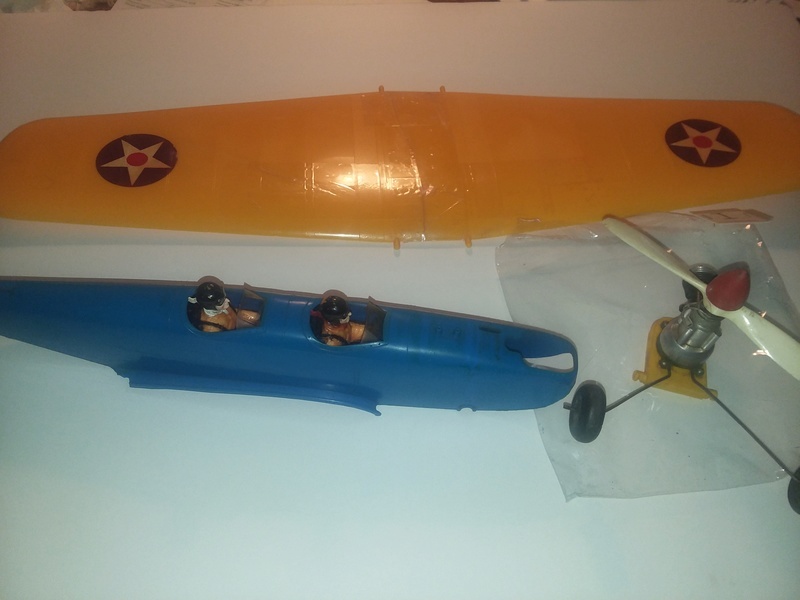 Pics below, last pic shows slight differences in the two late-model planes - one has the round, translucent tank, other has the polygonal one. Pilot assembly is different, too. Edit - Added pic of convenient eBay find, today. Cool Peter! My PT-19 is the later version with the external tank.. and my translucent tank-bowl won't stay secured in place... so I've been grappling with mounting a replacement-tank up "high-enough" in the nose to gravity-feed the engine. I haven't messed with pressure-feeds like a bladder yet. For this airplane; I'd like to keep it "simple".. but I've already failed in an attempt to mount a wedge-tank too low in the fuse. 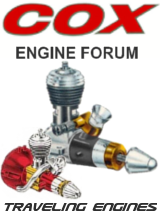 There isn't enough vacuum to draw fuel up below the venturi to feed the engine past an exhaust-prime. I have the materials for making simple bladder tanks, which would work for this. Just a balloon and a rubber stopper and brass tubing through the stopper. No Pressure. very simple, you would just need to accommodate a shelf for it to sit on, a little containment so it doesn't fall out. All parts were cheap on eBay. Someone here or one of the other sites turned me onto it. Let me know if you want an eBay buy-list. Mine had a 2" crack starting at the LE. I cleaned it with acetone and sanded the area around it and cleaned it again. Then I applied overlapping strips of fiber packing tape to the sanded area with the fibers running spanwise, wrapping around the LE so it was over and under the crack. Then I squeegeed it down tight with a plastic scraper and wiped spar urethane over it to hold the edges down and prevent fuel intrusion. A few years and a few flights later it shows no sign of detaching. Prior to this, epoxy had failed in a short time and so had plain packing tape. I'll see how far simple packing tape gets me, and I think the fuel is going to get under it - in the short or long run. Sealing your tape made the difference. I have some of that fancy reinforced tape around here, somewhere. Great to keep all these oldies flying - band-aids and bailing wire. I think a balloon tank would work nicely on this plane. Maybe inside of a film canister. Or even just a film canister by itself. Mine has just a balloon sitting in a little hammock at about the right height. Works fine. However you mend it; try to maintain the original dihedral-angle. 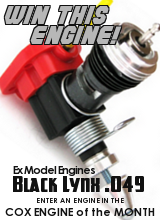 It will likely make a big difference in the way the model fly's. I don't see why that dihedral should be even noticeable. A C/L airplane does not need to straighten out a turn or to steer with rudder only control. I favor anhedral, and Keith Laumer used tip sweep forward, which has similar effect, on his Flea Whiz. But I expect those to have effect only in cross winds and probably not noticeable even then. I think it is a matter of structure, ground clearance and resemblance to the prototype. This idea of fixing things with tape, instead of glue is new to me. Maybe if I had read this thread in the 1970s my original PT19 might still exist. I remember that others flew it after I had learned to fly CL and that it accumulated scars until I gave up on it. I regarded the Sterling Beginners Zero as a much better airplane. David Ingham wrote: This idea of fixing things with tape, instead of glue is new to me. Maybe if I had read this thread in the 1970s my original PT19 might still exist.